Please note that all text in blue on this page represents a link to other pages on this website. With the recent release of the New Seekers Songbook, CD a further promised CD collection, future releases from Lyn Paul, Peter Doyle and Eve Graham all in the pipe-line and of course with the current line-up of the group touring the country with a fantastic show, it seems like a good time for the fans to consolidate and let the various record companies and world in general know what we would like to see with regard to future releases. Compared to those of many lesser known, lesser successful acts, the New Seekers catalogue has had a poor showing in the CD stakes, until recently, with very little but the occasional hit compilation reaching the market and only one original LP reappearing in CD form. There is still a lot of New Seekers material which has not yet been released to CD and so we are having a poll to see what the fans would choose to put on to CD next. We are also trying to open up a discussion to find out what the fans really want - to see all the original material released on CD? Better planned compilations? More concentration on the very early or later releases than the "classic lineup"? Something from the current lineup? Again, please post your thoughts on this on the Yahoo board, or if you prefer, e-mail them to me so that they can be included in our overall picture. Provisional closing date (just to get you focused!) will be the 31st July, 2006, but updates are available on the Yahoo Group message board, with a more detailed page on the Poppy's Place website. Please note that this poll has now closed. 1) any recording of Peter released before he joined the New Seekers (as a solo artist or group member). 2) any New Seeker recording which included Peter Doyle. 3) any recording (except New Seekers) which included Peter and was released after he left the New Seekers. If you want a reminder of all of Peter's releases check through the song list but please note the list does include some New Seekers songs made before Peter joined and after he left the New Seekers. Any recording Peter wrote or performed on will count. Peter Doyle's first CD was launched at a special event at the Kingston Hall, Moorabin, Australia. 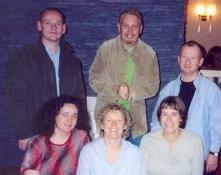 The first get-together by members of the New Seeker Yahoo Group, Blackpool.